From crony capitalism to geopolitical mercantilism? During the Asian crisis, the Russian crisis and many other financial crises around the world in the last few decades, this state of affairs was described as crony capitalism. Today, does this sound like another country we know? Has Wall Street and its culture hijacked America? The answer is clear. Let the bondholders and shareholders take the haircut so that we can get on with life. However, life isn’t that simple. In a past post entitled China’s golden rule, I speculated that “Obama administration may be waiting for China to reduce its exposure to the debt of the latest U.S. financial institutions found lying near death’s door before it nationalizes them.” China, by virtue of the size of its reserves, is now able to strongly influence U.S. policy at many levels, including what happens at Treasury. We can learn much from China’s evolution since WWII from rural backwater to major power. When the rule of imperialism, feudalism and bureaucrat-capitalism was overthrown by the people, many were not clear as to where China was headed–to capitalism or socialism. Facts give the answer: Only socialism can save China. The socialist system has promoted the rapid development of the productive forces of our country–this is a fact that even our enemies abroad have had to acknowledge. After the fall of the Berlin in 1989 the remaining true believers said Only China can save socialism! It’s now 2009, the western banks are burning, and everybody knows that only China can save capitalism! I have always been a proponent of understanding models and understanding the assumptions behind models as there are no models for all seasons. Knowing when a model might perform well or not perform well can give an investor insights into the market environment. I have been watching the performance of the trend following models, as proxied by the returns of the commodity trading advisors, or CTAs. The CTAs, as measured by the FTSE CTA Managed Futures Index, was one of the few groups of hedge funds that showed positive returns in 2008. This year their performance has turned negative. No wonder. 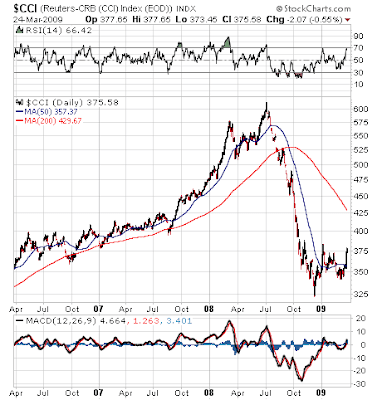 A look at the Continuous Commodity Index, which is the continuation of the old CRB Index before its re-balancing in 2005 to give greater weight to the more liquid energy complex, shows that commodities prices appear to be stabilizing as a whole. When commodities prices go from trending to flat, trend following models based on moving averages will naturally struggle as they get whipsawed in and out of positions. Of course, CTAs don’t just invest in commodities, but currencies, interest rate futures, equity indices, etc. Their negative performance YTD is another indication that the financial markets and world economy have stopped their freefall and undergoing a bottoming process (see my previous analysis here). There are some caveats to this analysis. First, the FTSE CTA Managed Futures Index is not a perfect proxy for CTA performance. The CS/Tremont Managed Futures Index, which reports monthly instead of daily for the FTSE index, showed a different pattern of returns for 2008 but both indices are negative for 2009 so far. Moreover, this indicator was far too early and gave false signals in the equity run-up as the CTAs began to struggle in 2005 and part of 2006, long before the S&P 500 peak in 2007. In addition to the durable goods and new home sales data yesterday, the performance of the CTA and their trend following models is another piece of the mosaic that indicates that we are undergoing a process of global economic healing. While the big picture is suggestive that disaster does not loom ahead, this form of analysis cannot be relied on for short-term market timing and does not sound the all-clear signal for equity bulls. The equity markets will likely trade sideways with volatile ups and downs over the next few months before a new secular bull can be launched. In light of the recent stories of hedge funds piling into gold and gold related plays (see this and this), I am still shaking my head over the fact that investors were buying gold stocks instead of gold and other inflation hedge vehicles. Perhaps it was bullish calls on gold stocks like this. Maybe it was the Fed's bombshell announcement last week, which whacked the USD and sent gold and other commodities soaring. Maybe it was analysis like this, which recalled the degree of leverage that gold stocks have enjoyed over bullion. The trouble is, gold stocks aren’t just a simple leveraged play on the gold price. As I pointed out before, a gold company could be simplistically thought of as a call option on the price of gold, with the strike price being the cost of production. My analysis also showed that most senior gold producers were raising production costs by mining lower grades of ore. Gold mining shares consequently did not perform as expected because of earnings disappointment. Moreover, as the gold price has risen from about $260/oz. in 2000 to over $1,000/oz. seen this year, the leverage of gold stocks to gold has diminished as a result of the rise. The scatterplot below, which charts the monthly change in the Gold Bugs Index (HUI) against the monthly change in gold, illustrates my point. I split the sample in two: when gold was below $500 and when it was above $500. As you can see, the degree of leverage shown by the period when gold was above $500 is lower than the period when gold was below $500. The average leverage of HUI to gold has been falling more or less steadily as gold prices has risen. It’s all rather simple once you think about it. If you hold an at-the-money call on gold, which is roughly what an investor did with gold stocks in 2000, the option's leverage to gold is relatively high. As the gold price advanced, the call option got deeper and deeper in the money and the degree of leverage declined. Once you throw in other considerations such as political risk (e.g. wars, etc. ), operational risk (fires, floods, strikes) and developmental risk (such as the Galore Creek fiasco), are gold stocks really worthwhile investment vehicles? More importantly, if commodity inflation does surface with a vengeance, then we will likely see negative surprises in the form of increased mining costs stemming from rising material and energy prices, which will squeeze gold mining margins. Of course, it depends on why you are buying gold. If the gold holding is a hedge against disaster, then some physical gold in the form of coins and bullion may be better choices. If you are looking for a pure inflation hedge, then perhaps inflation-linked bonds, gold ETFs like GLD, or a closed end fund like Central Fund of Canada (CEF), could be your vehicle. If you are looking for a leveraged play on gold, then you may want to look at silver (the metal, not the silver stocks), which is traditionally thought of as a leveraged play on gold. Another alternative could be the purchase long-dated options on gold bullion for investors. Buy gold stocks? The fact is, they are overly erratic and unpredictable vehicles as to be effective leveraged plays on gold bullion. Was that the real thing? Is this the new bull? Just as the consensus was forming that the rally from the lows last week was the start of a bear market rally (example here), the Fed announced that it invented another tool to throw money at the financial system by buying U.S. Treasury bonds at the long end of the yield curve. The announcement sparked off a stock market rally that took the S&P 500 to an interim resistance level of 800. What’s more, Merrill Lynch’s institutional survey shows increasing levels of bullishness among fund managers. If they start to put money back into the market, the funds flow could easily raise the S&P 500 by 100 points or more in fairly short order. Is this the start of a new bull? This has been a market of maximum frustration for many traders. While the consensus has been that we are witnessing a bear market rally, I would not be surprised that if the market powered itself upward and then fell back but does not test the bottom made last week, as expected by many technicians. Instead it bottoms at 5-10% above those levels, faking everyone out again. 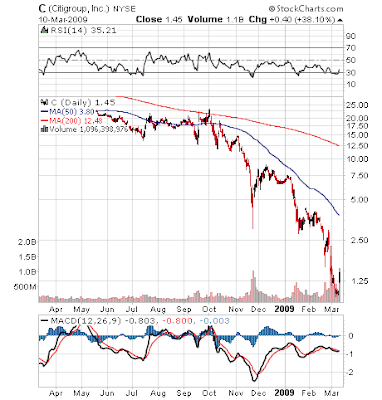 [P]ast bottoms were more often than not distinguished by investor disgust, exhaustion and apathy. Having been burned for so long by the bear markets that preceded those bottoms, investors resolved never, ever, to trust the market again. By the time the market did finally bottom, therefore, there were relatively few investors who were even interested enough to take notice. The fact is, I have no idea of whether we have seen the bottom of the market for this Bear. I tend to agree with Jeremy Grantham that equities look attractive right now. Long-term investors should have a long-term plan, which includes being fully weighted in equities (possibly on a dollar-cost average basis) at current levels. As an investor, you will find it very hard to catch the exact bottom but the likelihood of regret in 3-5 years is low if you bought into stocks in 2009. Sentiment: I would like to see sentiment measures, such as the AAII bull/bear ratio, approach new lows while the market makes a higher low (and forming a positive divergence). Phoenix list composition: The latest list of Phoenix stocks numbered 58 names. Of the stocks on that list, about 25, or 43%, were in sideways basing formations. I would like to see that percentage of Phoenix stocks in basing mode increase to at least 60% before I could be confident that a bottom is truly in place. Better market action from the financials: The chart below shows the relative performance of the KBW Banking Index (BKX) and S&P Homebuilder SPDRs against the S&P 500. Since the market is so focused on the troubles experienced by the banks right now, I would like to see some basing action from the banks and financials, much like the formation shown by the homebuilding stocks. In a recent post entitled Gold stock mystery, I had wondered that with the price of gold bullion nearing all-time highs, why were gold stocks underperforming? 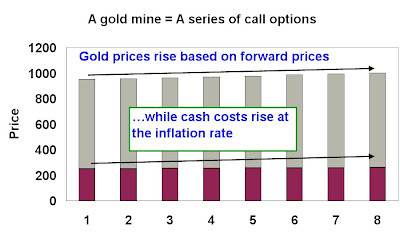 The main basis for my analysis was an option-based model for gold mining companies, where a gold mine could be modeled as a series of call options on gold, with the strike price being the cost of production. 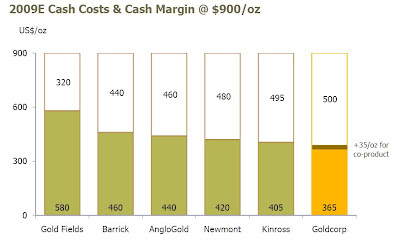 The reason why gold stocks are underperforming bullion is because higher production costs are depressing the value of the expected future cash flows. Why did production costs rise? When I examined the past annual reports of the senior gold miners, it became evident that the industry has adopted a policy of mining lower grade ore in order to better preserve and extend the lives of their mines given the elevated price of gold. In all cases where the company reported the figures, the grade extracted has gone down. This is consistent with the observation by one analyst who commented that while cost per oz. has risen, cost per tonne of ore has remained relatively flat in the last few years. If that is the explanation for gold stock underperformance, how do we make of the market’s reaction? Are gold stocks cheap relative to bullion? If the market is only paying attention to cash flow (which is what it's doing right now) and not asset value, then the current practice of voluntarily raising production costs to extend mine life and optimize asset value is a great disappointment to investors. On the other hand, if an investor is willing to take the contrarian view that he is buying cheap assets then the group represents great value. My view comes down somewhere in the middle. Over the course of an economic cycle, investors do not value companies on asset value until we get into the later phase of the cycle, when inflationary expectations are high. However, if gold and gold mining stocks are to be viewed as inflation hedges then we have to be cautious that if runaway inflation rears its ugly head, then gold mining and production costs will rise because of higher commodity prices (e.g. energy, metals, etc.) The rise in production cost may serve to counteract the higher leverage that investors may have come to expect from gold mining stocks compared to bullion. In that case, gold stocks may not necessarily be such great bargains after all. An investor could be better off in just holding bullion, or a long dated deep-in-the-money call option on gold if he wants a leveraged inflation hedge vehicle. Is Cuomo just piling on Merrill? Merrill Lynch & Co may have misled Congress in representing last November that it planned to pay out bonuses at year end, when in fact it decided to accelerate those payouts, New York Attorney General Andrew Cuomo said on Wednesday. The attorney general also said Merrill traders may have delayed taking hefty losses late last year until after the company decided to pay out $3.62 billion of overall bonuses. I qualify these remarks with the disclosure that I worked at Merrill’s research department until early 2007 and I don’t personally know any of the people involved. There are ways of showing a profit and temporarily hiding losses in complex derivative books but Cuomo’s accusations of traders manipulating their own P&L for to boost their own bonuses is a serious charge. It is certainly possible given this characterization of investment bankers, the obscene bonuses paid before the BofA takeover and how risk is managed at investment banks. I believe that the business model of Wall Street i-banks needs reform, but for Cuomo to level these charges without substantiation seems like a case of politically piling on to me. We need specifics, Mr. Cuomo. Who? When? What did they do? It seems that I am not the only one highlighting a Phoenix strategy these days. Mebane Faber wrote that John Templeton sucessfully implemented a Phoenix-like strategy in 1939. As well, Standard Life is offering a Phoenix themed fund for UK investors. As Faber points out in his post, some of the charts that passed his screen are truly nauseating. For example, Citigroup (C) remains in a downtrend despite the huge rally yesterday. To reiterate, I don’t believe that it’s time to buy into a Phoenix strategy yet, but the number and the composition the Phoenix list bears watching. 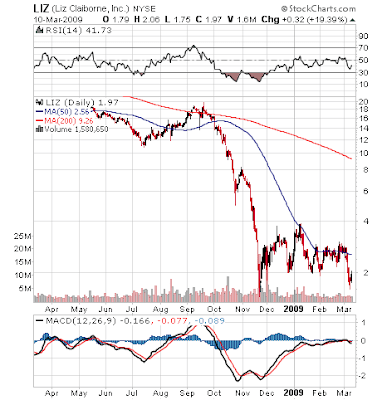 Why are gold stocks underperforming? The most obvious way to hedge against inflation and rising inflationary expectations is with gold and gold equities. However, gold stocks are not performing up to their potential in light of the relatively buoyant market for bullion. The chart below shows the monthly ratio of the PHLX Gold & Silver Index (XAU) to the London PM gold fix. I also linked the Amex Gold Bugs Index (HUI) to the XAU price series to show the difference between HUI and XAU. While HUI has outperformed XAU, both gold stock indices have been lagging the price of bullion in the past few years. 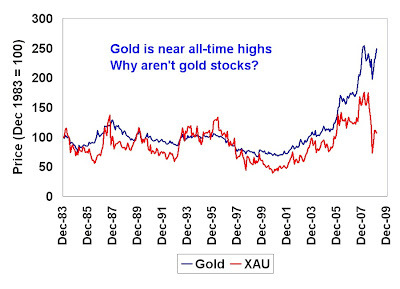 More importantly, gold stocks have not shown the same upside potential as they have in the past relative to gold. Analysts have advanced several interpretations of the relationship as shown by gold stock to gold ratio. The simplest explanation is that gold equities are cheap relative to bullion and that they should be bought now. Loss of leverage and speculative appeal? Another possible explanation is that as gold prices advanced, gold stocks have lost much of their speculative appeal as levered vehicles to play the rise of the yellow metal. When gold prices were $300 an ounce about a decade ago and production costs of the senior miners were in the $200-250 range, gold stocks were in effect call options on gold with a strike price in the $200-250 area. As gold prices rose, gold equities became deep in the money options and their leverage to gold declined. Speculators who wanted to play the rise in the gold price lost interest, especially with the introduction of very liquid gold ETFs around the world. While the loss of leverage thesis does hold some water, the numbers don’t make sense. About a year ago I wrote a posting on a synthetic gold mining stock model that I built in 2006 using a series of gold call options. When I revisit that synthetic gold mining stock valuation today, the synthetic still looks very cheap. The chart below shows the value of the synthetic compared to the gold equity index. The valuations started to diverge in early 2007 and the gap has been steadily widening since. Many ore bodies do not yield only gold, but other byproducts (e.g. silver, copper, etc.) The synthetic assumes that the mine only produces gold. The synthetic model only describes the asset side of the balance sheet for gold companies. If the company is financed with debt then the behavior of the equities would be different from the one forecast by the synthetic (but most gold miners don't have a lot of debt). Are gold stocks just cheap relative to bullion? If so, why the prolonged mis-pricing? Is there a conceptual error behind the synthetic gold model? Does the market just not think about gold stocks this way? Could a PE fund buy out a gold producers or mine and use the synthetic model to arbitrage the difference in value? Are production costs spiraling out of control at gold miners that investors are discounting the prices of their equities? Have gold mining companies, as a group, not re-invested their cash flows in a way that has enhanced shareholder value and therefore investors are marking down their share prices? I would be especially interested to hear any response from mining analysts. You can either respond directly in the comment section of email me at cam at hbhinvestments dot com. As the world waits for China of “will they or won’t they stimulate more”, there are increasingly bullish data points that line up for the inflation trade everywhere. Even at the elite level, the sense of frustration occasionally bubbles over. "We hate you guys," Luo Ping, a director-general at the China Banking Regulatory Commission (CBRC), complained last week on a visit to New York. "Once you start issuing $1-$2 trillion . . . we know the dollar is going to depreciate, so we hate you guys, but there is nothing much we can do." The path of least resistance seems to be resorting to the printing presses, but with Eastern Europe in trouble, the difficulties with the USD will not likely show up in the foreign exchange market, but the commodity market. A look at the Continuous Commodity Index, which is the continuation of the old CRB Index before its re-balancing in 2005 to give greater weight to the more liquid energy complex, shows that commodities prices appear to be stabilizing as a whole. The Baltic Dry Index is also giving the same message of stabilization. Despite the underperformance of the energy sector relative to other commodities, I indicated before that energy stocks aren’t giving up their relative leadership in the market, indicating that the sector may lead this market up in the next cycle. While the presence of strategic buyers do not usually mark the bottom of a market, it does indicate that these users see value in commodities at current levels. Gold prices also recently topped $1000, but have pulled back to about the $900 level. Interestingly, both gold and the USD have been rising in unison - a highly unusual situation as they have historically had an inverse relationship. This is explained by the fact that both are regarded as safe havens in times of financial stress – and the world is certainly stressed right now. What about gold? That one’s easy: it’s estimated that all the physical gold in the world that’s ever been produced amounts to roughly 140,000 tons (worth about $4.5 trillion dollars using $1,000 an ounce). About 75% of that is either in coins or jewelry… not available to China, or to any other government. Should we put on the inflation trade? My answer is a qualified yes for investors with a 3-5 year time horizon. However, there are still troubling signs that deflation may be the greater problem and must be overcome. We would also not overlook Richard Koo’s hypothesis that inflation may not be a problem despite all this fiscal and monetary stimulus. His contention is that as long as government spending and investment replaces private spending and investment, because households are in a saving and balance sheet repair mode, then inflation should not be a problem. Investors in the inflation trade need to watch closely for signs of inflation as economic recovery takes hold in the coming quarters. I didn't make these rules! I would like to thank everyone who gave me the feedback on my post In defense of the mutual fund manager, both online and by email. What’s handcuffing the fund manager? Pity the poor fund manager. Not only can he not even beat plain vanilla index funds, now a study shows that fund managers are bad market timers. What is handcuffing the fund manager? Why do our computers work so well -- except when we use them to manage derivatives and hedge funds? The answer lies in methodology. In science and technology, we rely on the scientific method: experimental design with dependent and independent variables and with reproducible results. Economists and financial experts like to fancy themselves as exact scientists as well. Back in the 1960s, when we landed on the moon, economists emulated the terminology of Space Age navigation. They spoke of "midcourse corrections" and of bringing in the economy for a "soft landing." Since then, quantification and modeling have only grown thicker in the economics profession, where econometricians and other "quants" employ complicated analytical techniques and mathematical formulas. Investing isn’t engineering. Good investment professionals and quants understand that we work in a business that has a low signal-to-noise ratio. It isn’t physics. You can’t repeat experiments. Investment returns depend on human behavior, which is fickle and depend on people’s hopes and fears. As an illustration of how difficult investing is, a study shows that the Sharpe ratio of legendary investors like Buffett, Robertson and Soros don’t significantly top 1.1. Who of us, as mere mortals, can hope to top those kinds of results? Turning good investment ideas into investment results is hard! Even if you a good investment idea, putting it together into a portfolio, or what quants call the task of alpha transference, is not easy. Peter Schiff had the right grand idea, but his implementation was lacking. He was not alone as many others were in the same boat. How sure are you of your idea? How much do you want to bet on it? How do you manage risk (your client’s risk, your business risk and your career risk)? When do you trade? How do you time your trade? If you are a large fund, how do you move in and out of a position without leaving footprints in the market? If things didn’t work out, what happened? Did your selection techniques fail? Did your risk control fail? Did all parts of your investment process work together or were they fighting each other? These are all issues that a fund managers need to address and face. Do we really want people who think “outside the box”? We all like to see innovative thinkers. We laud people who think “outside the box”. The reality is that society and organizations really don’t want people to think too far outside the box. Frankly, people who do that are mavericks. It’s hard to manage mavericks. They tell their superiors to FOAD (the last two stand for “And Die”). A frequent theme seen in Hollywood movies is the rebel who defies the system and win. How many rebels have you actually seen in real life do that? The System is not built to accommodate rebels. It certainly does not reward them. Here in Vancouver, there has been a long-standing tradition among the engineering students at the local university to engage in creative hijinks and pranks. Years ago, they stole the Speaker’s Chair from the provincial parliament. I recall one instance when a number of student engineers managed to steal the emergency lights from a police car. At one level, these are creative activities that should be encouraged. At another level, they are anti-social and disruptive and people who engage in such destructive behavior should be punished. Recently, a story emerged that some engineering students got caught trying to suspend a car from a bridge. Some of them may get charged. Criminal records may be involved and possibly future careers may be destroyed. In defense of the System, we can’t let every rebel and maverick run wild. Should mavericks like the Unabomber be made a hero? What about the perpetrators of the Oklahoma City bombings? What about the member of the Red Brigade? Baader-Meinhof gang? Weatherman underground? Tom Brakke, who writes the blog Research Puzzle, correctly pointed out that fund managers at actively unconnected to investors. In other words, there is a severe case of mis-aligned incentives. The current paradigm is: asset allocation accounts for most of an investor’s risk and return, followed (in equity-land) by country allocation, sector allocation, along with style (value/growth), sector and market cap. As a result, we allocate by these style boxes: international, emerging markets, domestic equities, large/small cap, value/growth, etc. Fund managers are expected to stay within their mandate and remain fully invested. Their job is to beat their style benchmark (e.g. large cap growth). There are funds that are permitted to be opportunistic and rotate between asset classes but those funds are relatively rare (e.g. Hussman Funds). While every few years or so, there have been calls to reform the fund management industry, I don’t see any looming competitive threats that will compelling a drastic re-thinking of this investment paradigm. A few years ago, hedge funds might have posed a serious threat had they been able to generate pure alpha, but it turns out that what hedge funds mostly deliver are different forms of beta, which in aggregate are not worthy of their 2 and 20 fee structures. I didn’t make these rules. Until something radical happens to challenge the business model of fund management, we are stuck with the current paradigm. Addendum: Barry Ritholz at Big Picture has an interesting post about conflicts of interest and mis-aligned interest at the asset allocation level for individual investors.